Why should you maintenance and disinfect your hair clippers? Properly taking care of your clippers, and trimmers is a vital part of cutting hair to ensure the longevity of your tools. It’s also important to clean, and disinfect each clipper before, and after each haircut. As well as oiling to maximize power, and cutting feed. By simply spraying andis cool care 5 in 1 onto your clipper blades you’ll disinfect the blades. It’s very important to spray them after every haircut. A dirty clipper blade that’s carrying bacteria can cause a person’s skin to get irritated, and cause red bumps. Also more serious things like fungal infections. So sterilizing your blades is a safe practice. 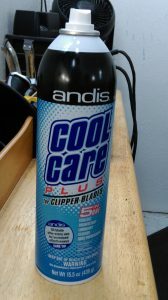 The andis cool care 5 in 1 also cools down the hair clipper blade if it starts to get too warm. In addition the hair clipper it’s self can be sprayed if the clipper housing gets to hot to handled. Simply spray the hair clipper blades in between haircuts with the hair clipper off if the blade starts to get too warm then wipe the blade with a paper towel. Your tools run smoother, and operate at maximum performance when you regularly keep them maintained. It’s also pretty easy, and simple to do this. All you need is clipper oil, a brush, and a disinfectant spray like Andis 5 in 1 cool care spray to clean, cool, and sterilize the blades. This is just the basic things for a simple, and fast maintenance for your tools. First brush off access hair off the clipper blade then add couple of drops of oil onto the front of the blades with the clippers on, and then add a drop on the each side of the blades. With a towel wipe off the access oil. Next spray andis cool care to disinfect the blades. It’ll take approximately 10 minutes for the andis 5 in 1 cool care formula to fully disinfected the clipper blades. You can also spray disinfectant first then oil the clippers either way is fine . This a simple, and effective maintaining practice that’ll help your tools cut better, and last longer. If you use your tools on a daily basis daily maintenance should be done to ensure the longevity of your hair clippers, and trimmers. This includes brushing off acces hair off your clipper blades, oiling your hair clippers after every haircut, and then applying andis cool care 5 in 1. Besides daily maintenance you can deep clean your tools by taking the blade off, and using a brush to clean the access hair off the guide blade, and the cutting blade. 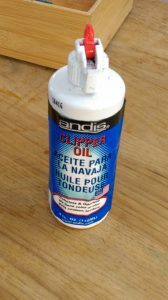 Then follow up by spraying the blades with andis cool care, and adding a few drops of oil on the blades after you screw them back together on the hair clipper. How often should i sanitize my hair clippers and Trimmers? You should disinfect your hair clippers, and trimmers after every haircut. It’s very important so when you use it on another person it won’t be carrying, and passing on germs. Cleaning the inside of clipper should be done once, or twice a month if possible. If your housing has screws you’ll be able to unscrew the housing to clean the inside. All you need is a small brush to brush off access hair from the motor, and surrounding area’s, and using a towel to wipe up accesss oil, and dirt that builds up over time. After all done just screw the housing back onto the clipper. You’ll notice the difference on how smoother the hair clipper operates when cleaned. Here’s some videos on how to simply maintain, and clean your tools. Thank you for a great article and advice for maintenance and disinfecting hair clippers. I showed your article to my friend who is a hairdresser here in Turkey and he would like to get his hands on Andis 5 in 1 cool care spray. We don’t seem to have this in Turkey, how can he buy this? Hi if there’s a beauty supply store in Turkey they should carry this product if not a product similar, but if not you can get it online on Amazon, or on eBay. In the near future I hope to have them available here on my site. Thanks for embedding the video with regards to thoroughly cleaning Wahl Clippers. I generally just undo the clipper parts to clean in fear of further undoing and creating problems. After watching this simplistic assembly process I’ve cleaned mine up a treat and back together without a hitch. Like anything, once shown you’re away. I always oil mine to keep things running smooth but your additional hygienic application of ‘Andis cool care 5 in 1’ in order to disinfect represents another duty I will initiate. Yeah no problem thanks for the comment, and you’re right. Once shown how to do something it becomes a lot easier just have to try, and do it. Yup i recommend the andis cool care it will disinfect, and cool your blade if it starts to get warm on the scalp. Hi Junior. Thank you for this timely advice. I think that maintaining and cleaning any kind of equipment of this kind is important but I think a lot of people will not go this extra mile to keep things hygienic. Can you use any time of oil or does it have to be a special type? Hi Gail you’re welcome and thanks as well. You’re right every type of equipment should be cleaned, and maintained and people usually don’t really keep up with the maintenance, but it’s important. You can use any clipper brand oil like Wahl,Andis,Oster, Conair, but yeah it has to be clipper oil specially made for clippers. WOW, what a great advice you have given in this article. People usually use clippers and for get to disinfect and clean it, or they dont bother cleaning. You have shared really important advice along with video demo, this will be very very helpful for all the people. Thank you so much. Thank you for your comment Sarah. You’re right a lot of people don’t bother cleaning there clippers at all. Which may seem like no big deal, but in reality the clipper blades can carry a lot of germs. and spread onto people’s scalps so it’s important to disinfectant the hair clippers.